DIVE IN!!! 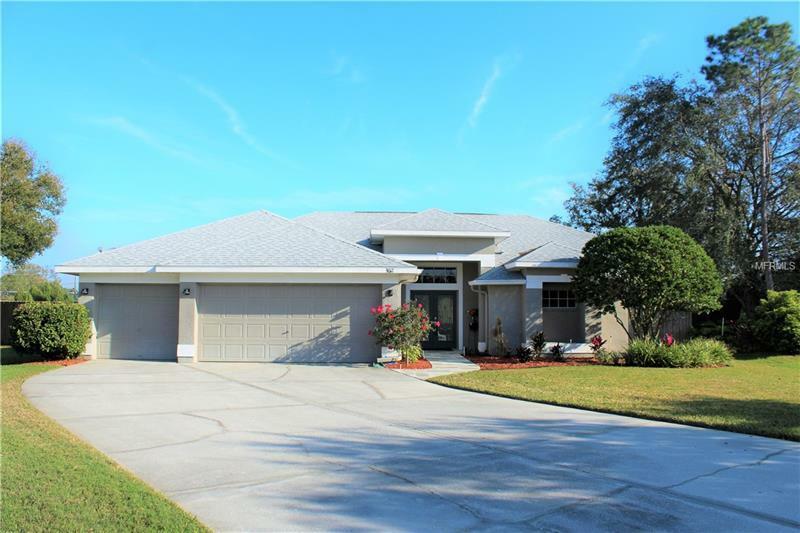 TO THIS STUNNING POOL HOME in a Gated Community. Spacious 3 Bedroom, 2 Bath with an OVERSIZED 3 CAR GARAGE with an extended driveway that has room for 8 Cars! Covered Entryway with a stunning Double Door Entry with Etched Glass Doors. Formal Living & Dining Rooms with Custom Paint, High Ceilings, Decorative Plant Shelf & Custom Tile. The Master Suite has soft, cushy, Carpet and a Glamour Bath with a Glass Block Accent at the Custom Shower, Dual Sink Vanity & Walk-In Closet. Updated Kitchen has Stunning Cambria, Quartz Counter Tops, Smooth Top Range, Drop Pendant Lighting, Breakfast Bar (with built in Storage) and Glass Tile Backsplash. Split Bedroom plan with HUGE Secondary Bedrooms – One bedroom has a Full Wall Built-In with Book Shelves, Desk & Computer Area, The other has a LARGE Walk-In Closet. The Secondary Bath has an exterior Door that can serve as a pool bath. Covered Lanai with Custom Designed Cool Decking on the Lanai and around the Salt Water Pool. Large Fenced Yard. Extras Include: Updated lighting, Faucets, plus EXTRA Wide Doors pocket doors (the house was originally built with some handicap compatible modifications). The 3 Car Garage was originally designed to accommodate a ramp so the length is almost 4 feet longer than most standard garages. New Roof installed in 2016. SUPER CLEAN! Great Location, close to Elementary & Middle Schools as well as Public Library & County Recreation Center. Low Association Fees of only $805 per Year and No CDD’s. Pet Restrictions: Buyer to Verify any and all Pet Restrictions through HOA Management Company.